Tucson Nursing Home Improper Medical Treatments Attorneys, Nursing Home Abuse Lawyers | Russo, Russo & Slania, P.C. Has someone you love received improper medical treatment in a Tucson nursing home? If so, the nursing home abuse lawyers of Russo, Russo & Slania, P.C. are ready to stand up for you. While under the care of physicians, nurses, and staff in nursing homes, residents place faith in the professionals who are employed to take care of them. When a patient receives improper medical treatment, this trust is not only broken, but the health of the victim could seriously decline or worsen. If you or your loved one in a nursing home experienced improper medical treatment by receiving improper or poorly executed treatment methods, being prescribed a medication that was unnecessary, or from being deprived of the reasonable medical standard of care, you might be eligible for compensation. An experienced nursing home lawyer at Russo, Russo & Slania, P.C. will review the details of your case and see to it that justice is served. The Tucson nursing home abuse lawyers of Russo, Russo & Slania, P.C. have helped hundreds of nursing home residents in the last 60 years. Since 1956, our firm has recognized that no matter the age, physical state, or mental condition of a person, they have the right to be treated well. It is with this philosophy that we represent nursing home residents who have received improper medical treatment while residing at a nursing home. Our team has no tolerance for such behavior by those in the medical field. We are prepared to pursue justice on behalf of your loved one. Our team is AV Peer Review Rated by Martindale Hubbell as “Preeminent,” and we are members of the American Association for Justice. Over the last 60 years, we have gone above and beyond to make up for thoughtless mistreatment in nursing homes by providing high-quality legal representation to those in need. The elderly people we see are much more than nursing home residents; we consider them family and neighbors. It is within this vein of thought that we are able to extend compassion and empathy to those who have not been medically treated as they should. We will chase justice on behalf of Tucson nursing home residents who are mistreated. If you or someone you cherish has not received proper medical care in their nursing home, contact Russo, Russo & Slania, P.C. right away for a consultation with one of our preeminent Tucson improper medical treatment in nursing homes lawyers. Call us at (520) 529-1515 or fill out our email form to get in contact with one of our skilled attorneys. The responsible physician and the nursing home can be held liable for carrying out any of the above actions against a nursing home resident. By not abiding by the appropriate standards, a physician or nurse is prolonging a patient’s pain or potentially worsening their condition. When this occurs, the patient can be put in danger, and their health could rapidly degenerate. Why Choose Russo, Russo & Slania, P.C.? Experience: Russo, Russo & Slania, P.C. was founded in Tucson, Arizona in 1956. Very few firms in the state can claim that kind of longevity and boast the same level of experience. Each of our partners is highly qualified to handle the specifics of your improper medical treatment case. 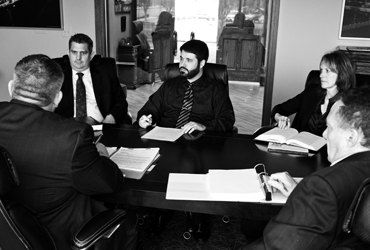 Track Record: Our firm understands that you want to utilize a trusted lawyer who can deliver exceptional results. Time is on our side as we have proven ourselves in the last 60 years to be distinguished lawyers who are continuously able to acquire substantial settlements and verdicts for our clients. We encourage you to view a sample of our major wins to see what our firm is able to deliver to the community. Our Incredible Team: The nursing home lawyers at Russo, Russo & Slania, P.C. have garnered a national reputation for our work on behalf of injured, ill, and abused clients. Our managing partner and attorneys have been recognized by rating services and associations from across the country for their hard work. Our attorneys are members of the Association of Legal Administrators, have an AVVO rating of 10, were ranked by the ASLA in 2014 as part of the Top 40 Lawyers under 40, are members of the American Association for Justice, were AV Peer Review Rated by Martindale Hubbell as “Preeminent,” and are Lead Counsel rated. If you or the relative you cherish has suffered from improper medical treatment while under the supervision of a nursing home, they could be awarded monetary damages for their pain, suffering, injuries, and illnesses. At Russo, Russo & Slania, P.C., we believe the elderly have a right to receive quality medical care. When a nursing home fails to deliver such results, the nursing home lawyers at our firm are prepared to fight against the responsible party. We have been representing the elderly since 1956, and we know how worrisome and overwhelming it can be when a loved one receives poor-quality medical care. If you or a loved one has received improper medical treatment in Tucson, Arizona, contact our firm immediately. Call us at (520) 529-1515 or fill out a contact form to get in contact with on our skilled attorneys.